A video groups clips together to create a story. 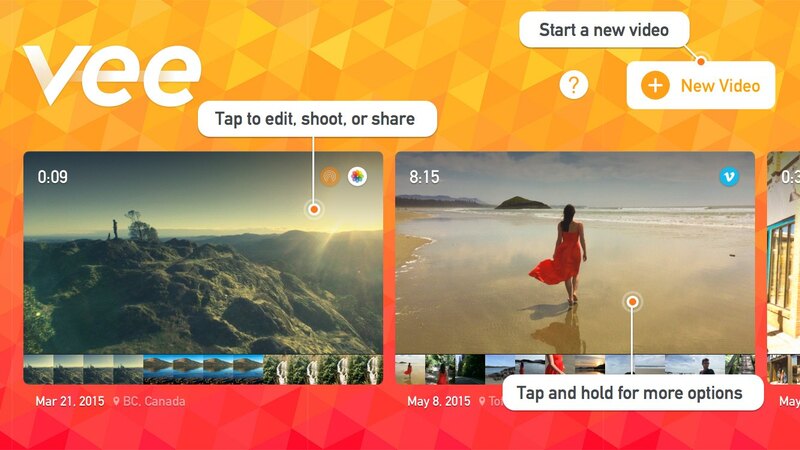 Vee lets you work on multiple videos at once, each with their own clips. Scroll through your videos on the Videos screen, then tap a video to play, edit or to shoot more clips. Tap and hold a video for more options. Once you’ve started a new video you’ll be on the Shooting screen with an empty timeline. Just tap the Record button on the right hand side of the screen to start shooting. 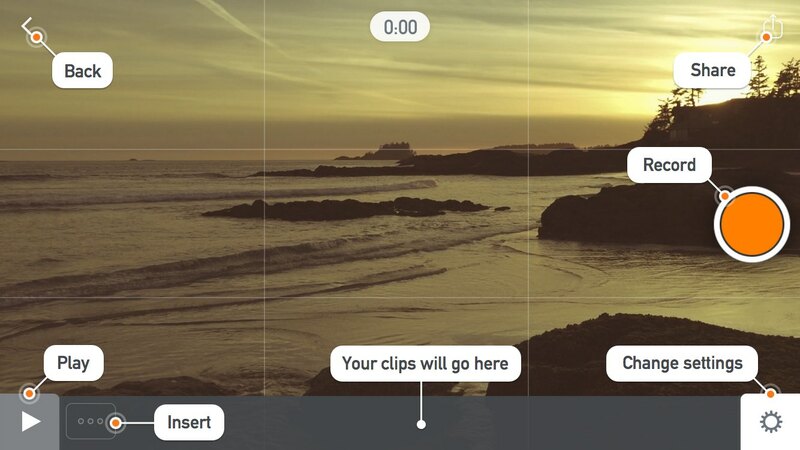 Each clip you shoot will appear in the timeline at the bottom of the screen. You can also import clips from your photo library by tapping the Insert button at the end of your timeline. Now that you’ve shot a clip, let’s edit it. Tap on the clip in the timeline to reveal the editing controls. Tap the “Trim” button to enter trimming mode, then drag the orange trim handles on your clip in the timeline to choose the best parts of your clip. Tap “Done”, then press the Play button to preview your work. Let’s see how your clip looks with one of Vee’s high quality video filters. Tap on a clip to edit it, then tap the “Filters” button. Scroll through the filter previews and choose one you like; perhaps choose the “Pro” filter. Tap “Done”, then play your video. Now that you’ve edited your video, you can try sharing. Tap the Share button, and then pick “Save Video” (you may need to scroll down to see it). Now your video will export, and when it’s done your video will be saved to your camera roll. Go to the Photos app and check it out! You’ll have noticed there are lots of other sharing options! You can read more about sharing in our documentation, or just have a look around and try them out. That’s it! There’s lots more to discover, but you’ve got the basics and you’re ready to start telling your stories with Vee. Go forth and shoot stunning videos — we can’t wait to see what you create!